Everted mouth that flares slightly; shallow curved belly; small circular foot. Cobalt-blue underglaze decoration of floral sprigs of the four seasons on bowl's interior. White rabbit and the jade cassia tree (bai tu yu gui) on bowl's center. Exterior has phoenix tail patterns against a carmine ground. Famille rose floral sprigs are on top. On all 4 sides are panels of florals from the 4 seasons. 6-character inscription in seal script in cobalt-blue: "Made during the Daoguang reign of the Great Qing". Unglazed base of circular foot. Clear glaze on interior, exterior, and base of foot. Daily used ware. Condition: Basically intact. 1: Slight chips on rim. 2: 2 lines towards rim. Wide chip. 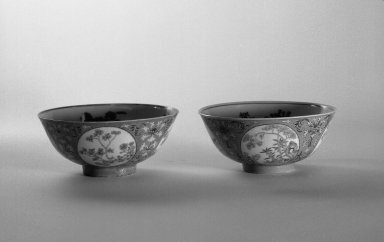 Old Accession Card: Pair of bowls, known as "Peking bowls," with straight low feet and rounded sides spreading a little at the mouth rim. White glazed porcelain decorated on the outsides with four medallions with flowers delicately painted in thin mixed enamels, reserved on a ground of pink enamel engraved with an all over pattern of close feathered scrolls, in the manner known as graviata, and further enriched with stylized flowers painted in polychrome overglaze enamels. the insides of the bowl are decorated with a medallion in the center containing a rabbit (?) among rocks and trees, and on the sides with four sprays of flowers, painted in underglaze blue. The bases of both bowls are glazed white and have six character Daoguang seal marks in underglaze blue. The pink enamel ground on 1 is a light pink and the underglaze blue is pale and rather gray. Both the pink and blue on 2 are much darker. The edge of 2 is chipped, cracked, and repaired in two places. This type of bowl is said to have been sent to Peking as a yearly tribute to the Emperor who presented them to European and other visitors.